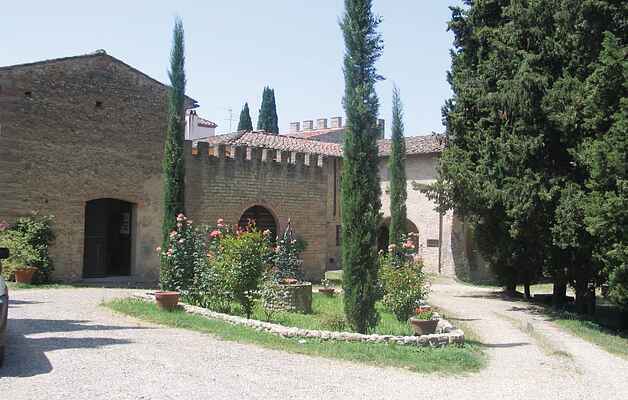 Medicean castle with holiday apartments located in a silent position in the midst of wine yards and olive groves in the Florentine hills at 4 km from Montespertoli. The castle is composed by the manor house dating back to 1200 and a beautiful farmhouse subdivided into 20 holiday apartments with simple furniture in Tuscan style from where you enjoy a beautiful panoramic view. A large room for breakfasts, lunches and dinners may be used upon request and upon payment. At the guests’ disposal the shared garden with swimming pool and barbecue. Each apartment has its own equipped outdoor area. In the surroundings of the castle you will find many characteristic restaurants, trattorias and wine cellars where you can taste traditional Tuscan dishes and participate at wine tastings and wine tours. The pool is at a distance of 100m. See ITF340-ITF347.